Rhubarb Galette – Dig Delve – An online magazine about gardens, landscape, growing & making. Raymond Lewis, the farmer who lived here before us, was born in this house shortly after his parents moved here in the early 1930’s. Although he raised cattle, his parents had been market gardeners and it is our nearest neighbour, Glad, who has been the fount of all knowledge regarding how the land here was used before we arrived. She too was born here, in the house just above ours on the other side of the lane, and went to school with Raymond. She has a prime view over our slopes. It was she who told us that we were planting our new orchard on the site of the Lewis’ old orchard, that the hollies by the Milking Barn were harvested each year for wreaths destined for the Christmas Market in Bath and that the extra-scented, large violets we found growing everywhere were wrapped in leaves and tied with cotton for spring posies. When we expressed amazement at finding ‘wild’ gooseberries and redcurrants in our farthest hedgerow, Glad said that it bordered the field where the soft fruit had been grown and so we realised that they had arrived through the actions of thieving birds. 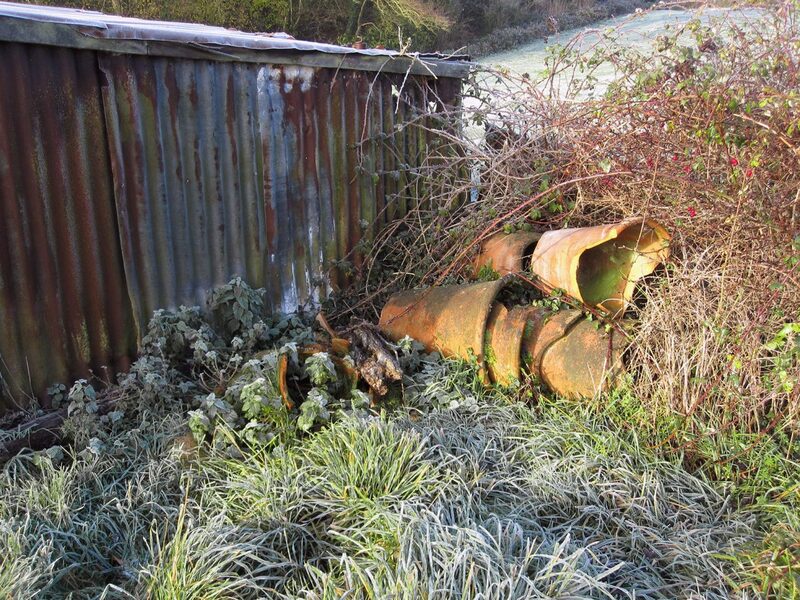 Another piece of growing history she imparted was to do with the ramshackle shed half way down the field in front of the house. 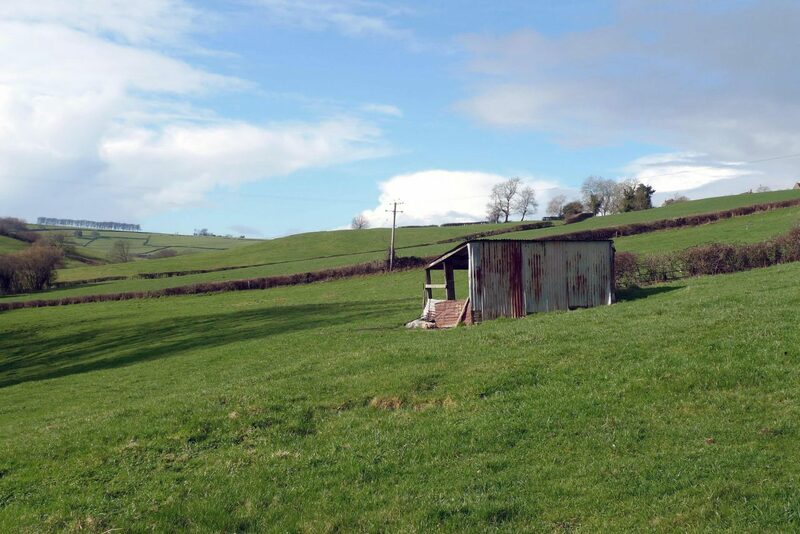 We had been charmed by this little structure from the first time we saw it, but couldn’t work out what it had been used for. Made from a motley collection of wood and reclaimed corrugated tin sheeting and open on two sides it is barely high enough to stand up in. It evidently hadn’t been used by Raymond’s cattle, and it was too far from the house to have had any obvious purpose such as a vegetable or wood store. The clue to its use was revealed the winter after we arrived, when clearing the mess of bramble from the hedge that runs up behind it. There in the undergrowth were a dozen or so terracotta rhubarb forcers. Unfortunately all but a couple were broken beyond use, but it was suddenly clear what the little shed had been used for. We asked Glad at the first opportunity and she confirmed that it had been ‘the rhubarb forcing hut’, which is how we have referred to it ever since. We have often imagined Mr. and Mrs. Lewis in there in deepest winter, inspecting the covered crowns by candlelight (as they still do in the Yorkshire rhubarb triangle to prevent the stalks colouring) and then carefully harvesting armfuls of the pale pink stems to take to market. Now it provides shelter for the sheep that graze our pastures and has sometimes protected us from sudden summer downpours when the water runs off the roof in sheets. We have three varieties of rhubarb in the Kitchen Garden here which take us through spring and early summer; Timperley Early, Champagne and Victoria. The first is, not surprisingly, said to be the earliest, and has always been so for us. We have found it possible to force it for stems in February. The other two are later and tend to come together if left uncovered, but by forcing one of them and leaving the other – on a yearly rotation – we can have rhubarb until June. Beyond that and it can become a little long in the tooth and green to eat fresh, but is still perfectly serviceable for jam. 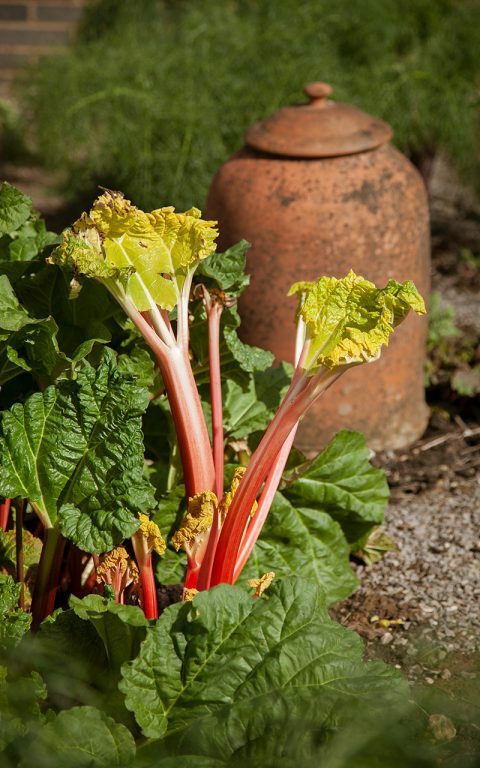 When forcing rhubarb it is important to only cover part of the crown and, when ready to harvest, to take the slenderest stems and leave the strongest to feed that part of the plant for the future. To allow it to rebuild its reserves you should then choose a different part of the crown to force the following year. The flavour of forced rhubarb is so subtle that it needs the simplest of treatments to show it off to its best advantage. Most often I just roast it and serve with a creamy accompaniment of buttermilk pudding, pannacotta or, simplest, a mixture of whipped double cream and creme fraiche. I find orange, the customary partner of rhubarb, overwhelms this early season delicacy. However, judicious use of thyme or rosemary adds an unexpected counterpoint that suits this fruit that is actually a vegetable. It also has an affinity with the aniseed used here, but it’s not essential, so leave it out if you prefer. The pastry is based on a recipe by Alice Waters of Chez Panisse, and is a fast and easy way to achieve a deliciously flaky result. Its success relies on using the best quality butter and flour and the very lightest of touches to ensure the pastry stays as cold as possible. 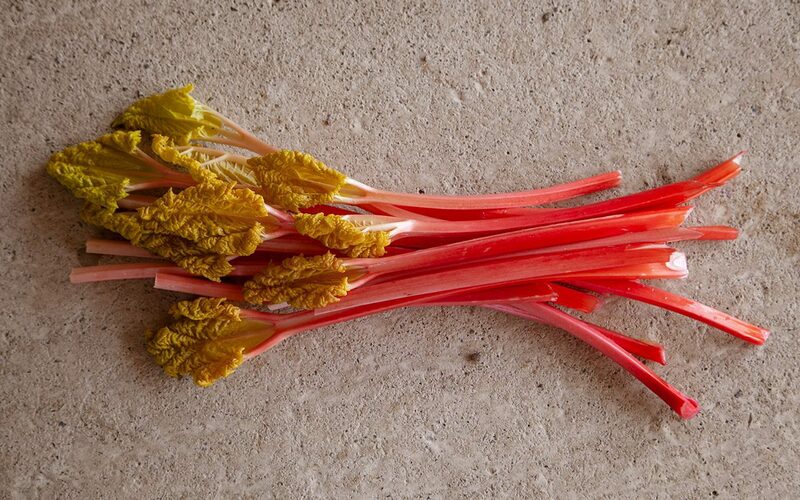 If you are using open grown rather than forced rhubarb you will need to increase the quantity of sugar in the filling by at least 25g, depending on how tart you like your rhubarb. Take the butter, still in its wrapping paper, and put it in the freezer for 20 minutes to harden. Sift the flour into a bowl with the icing sugar. Add the salt. Remove the butter from the freezer. Unwrap about 2/3 of the block and, holding the end of the block in the paper, coarsely grate it onto the flour. To avoid grating your fingertips you may need to cut the very last of it into small pieces. Using a sharp knife and rapid slicing and lifting movements cut the flour and butter together until the mixture resembles coarse gravel. The butter should be visible in a variety of different sizes, but few should be bigger than a pea. Continuing to work as quickly as possible, sprinkle the iced water over the mixture 2 tablespoons at a time. Each time use the knife to mix the water into the flour and butter. When you have added all of the water the mixture should just start coming together, but there will still be dry flour visible. Use your fingertips to see it it feels like it will come together. If it seems too dry add another tablespoon or two of water – but no more – and mix through again. Then very quickly, using your fingers and not the palms of your hands, bring the dough together into a ball. Do not knead it or overhandle it. The dough should feel cold. Lightly dust a piece of greaseproof paper about 40cm square with flour and place the dough onto it. Gently and quickly flatten the dough with the palm of your hand into a rough circle. Take a floured rolling pin and, using light, rapid movements, roll the dough out into a circle about 35cm in diameter, rotating the greaseproof paper in quarter turns after each pass. Reflour the rolling pin if it starts to stick. The pastry will be very short, so don’t worry about the edges cracking. Lift the greaseproof paper and dough onto a heavy baking sheet and put in the fridge for 20 minutes to chill. Set the oven to 200°C (400°F, gas mark 6). Cut the rhubarb into pieces about 8cm long. Put into a non-reactive (glass or ceramic) bowl. Sprinkle over the caster sugar and vanilla essence and toss together briefly. Leave to stand while the dough is chilling. Remove the baking sheet from the fridge. Working quickly again, sprinkle the ground almond evenly over the pastry leaving a 5cm border. Arrange the rhubarb on top of the almond. 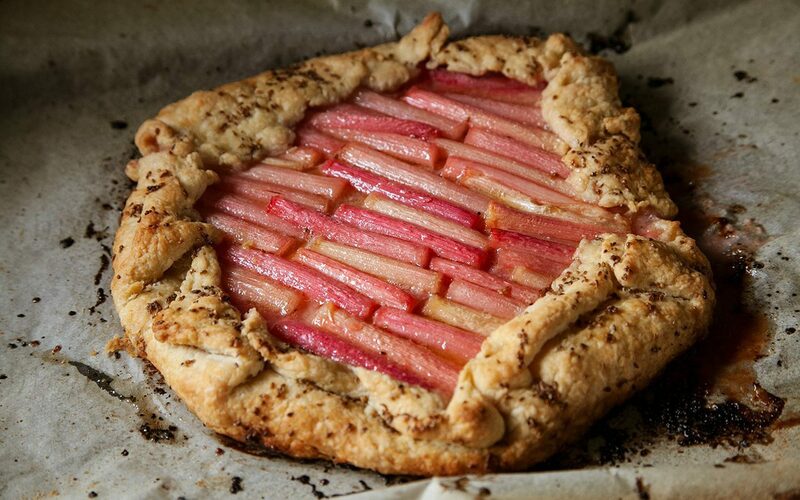 You should have enough rhubarb for two layers. The first can be arranged somewhat haphazardly, and should use up any larger pieces. You may need to cut these in half lengthways to ensure they cook evenly. Retain the smaller stems for the top layer and arrange them more pleasingly. Then, working around the circle, gently lift the edge of the pastry up over the rhubarb, folding, pleating and gathering as you go. Pinch it together quickly if any tears appear, since you want to keep the juices in as far as possible. Don’t worry too much about appearances though. You want to ensure that the pastry holds the rhubarb in place, but it is more important to get the chilled pastry into the oven quickly than for it to look primped and perfect. In a small bowl put the aniseed or caraway seed, icing sugar and water. Stir until the sugar has dissolved. Add the melted butter and stir to combine. Brush this mixture generously over the pastry. Put the tart straight into the oven and cook for about 40 minutes until the pastry is golden brown and the rhubarb bubbling. While the tart is cooking put the rhubarb trimmings, water and sugar into a small pan. Bring to the boil, then simmer until the rhubarb has disintegrated and the liquid is syrupy. Strain the liquid off and, when the tart is cooked, gently brush this syrup over the rhubarb. Serve warm with single cream.